South Terrace in Fremantle, Western Australia. The City of Fremantle has already endorsed the Welcome Zone Initiative, a project from the Refugee Council of Australia. "Rural Australians for Refugees (RAR) proposes a scheme, which provides an alternative to mandatory detention for asylum seekers." "RAR believes that asylum seekers should stay in reception centres only until relevant health and security checks are completed." "We propose a pilot project whereby, following these formalities, local committees in regional towns sponsor at the outset, two or three families or family groups of asylum seekers in the community until their requests for asylum have been completed and their settlement in Australia is secured." 8 October 2002: A presentation to Council: Newcastle as a Welcome Town - This is the actual presentation to the City of Newcastle by Newcastle Action for Refugee Rights (NARR) during a council meeting in 2002, which assisted the council motion being supported and carried to declare Newcastle to become a 'Welcome Town' for refugees. The material was presented by Steve Georgopoulos and Anne McLaughlin. 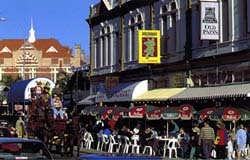 15 September 2002: Newcastle and Bega become Two Welcome Cities - Thanks to the local government lobbying of many refugee advocates, both from Rural Australians for Refugees and Newcastle Action for Refugee Rights (NARR), the City of Newcastle as well as the Bega Valley Shire recently tabled motions that were endorsed and carried, endorsing the concept of Welcome Towns, formulated by RAR. some volunteers who are happy to become friends and associates of refugees or refugee families with the purpose to help refugees acclimatise in the local and regional environment: assist with shopping guidance, help with bus and train time tables, understanding Centrelink requiremenents, assist with approaching legal representatives. The main purpose of this 'team' is to understand and coach people who have no prior exposure or training in living in an English-speaking and western society. One or more lawyers who are happy to assist refugees - and who actively support assisting refugees - in thir assessment, review and appeals procedures. These lawyers may not always live exactly within the municipal boundaries, but they need to have declared their preparedness to consider requests for assistance from refugees. There is already a growing list of legal professionals around Australia who have worked on a pro-bono basis on refugee casework, and the list is growing! A professional counselling practitioner who is skilled in trauma-counselling. Regrettably it must be assumed that all asylum seekers have come to Australia are victims of trauma for a variety of reasons. Some have endured persecution because of their political, social or religious background in their country of origin, and, even more regrettably, it also must be assumed that asylum seekers who have gone through the Australian assessment procedure, often accompanied by prolonged periods of incarceration in one of Australia's detention centres, are carrying a secondary layer of trauma. It is essential - and not a luxury - that these asylum seekers have assisted access to trauma counselling services. Defined project financial sponsorship: individuals or families who sponsor just one thing in the life of a refugee: a phone bill, petrol for a car used by a refugee family, or some other item. Especially after recent announcements by the Minister of Immigration, where he called into question the status of 7500 Temporary Protection Visa holders, an increasing number of TPV holders are in a position where there rights for income maintenance or their permission to work may be called into question. Even without this impending threat, the life of a refugee on a TPV is financially precarious. Generous help is needed by us, the decent ones amongst Australians. RAR began in the Southern Highlands of NSW, Australia, in October 2001. An informal group of concerned citizens from across the political spectrum began a community education program about the situation of asylum seekers. This education program involved leafletting in the streets and outside the supermarkets, and informing the local community through the local press and the radio. A most successful public meeting was held in Bowral in early November and attended by 500 people. Over 400 signatures on an open letter were collected and published in the local paper, protesting the Government's policies. RAR's policy is detailed in our ten-point plan of action (See our website). Our program of action includes ongoing community education, the collection and dissemination of Welcome Books with community signatures and messages of welcome to detainees and a Welcome Towns proposal, which has wide spread support in rural and regional Australia. Across the country there are now some twenty RAR groups. Quite a number of these have active committees who are ready to take part in a pilot scheme welcoming asylum seeking families into their communities. Rural Australians for Refugees (RAR) proposes a scheme, which provides an alternative to mandatory detention for asylum seekers. RAR believes that asylum seekers should stay in reception centres only until relevant health and security checks are completed. We proposed a pilot project whereby, following these formalities, local committees in regional towns sponsor at the outset, two or three families or family groups of asylum seekers in the community until their requests for asylum have been completed and their settlement in Australia is secured. This proposal is being made in response to the growing Australia-wide concern regarding the Government's policy and practice regarding the detention of asylum seekers in detention centres across Australia and in the Pacific region. Increasingly the Federal Government is under national and international pressure to review this policy which, as it is presently being implemented, is violating Australia's international treaty obligations regarding the treatment of asylum seekers. This proposal is also being made in the light of the recent situation in the Woomera detention centre in South Australia where serious attempts at self harm have been undertaken by detainees, and in the light of ongoing serious attempts at self harm by detainees in other centres. Over the past twelve months there has been a growing chorus of community concern regarding the Government's policy on asylum seekers. Political leaders, community leaders, religious leaders and leaders in the business community have all been outspoken in their condemnation of the Government policy on this matter. Numerous RAR groups have been working actively in towns across the country and all report a growing community concern. RAR in Bowral has been working actively in the community providing information and gaining considerable support for our various activities. In this a conservative political stronghold we have observed a significant shift in public opinion on this issue since the Federal election in November 2001 with more and more people calling for a change in Government policy. In recent months, thousands of Australian have offered to take in asylum seekers rather than see them incarcerated in detention centres. They have offered their spare rooms and sofas, in acts of generosity that demonstrate their good will towards people who have arrived in Australia with nothing. The model that we are proposing has precedence in New Zealand, in Sweden and in the United Kingdom. Considerable material is available on these alternative models which have been shown to have positive benefits to both the detainees and the community. RAR is proposing that we work in partnership with Government to provide an alternative to mandatory detention for asylum seekers. We propose that local committees in regional towns offer to sponsor at the outset two or three families or family groups. We propose that each rural town committee undertake to provide housing, to co-ordinate the provision of household goods where necessary and to help with general settling in and socialisation. This committee would also help co-ordinate local appropriately skilled and screened volunteers to assist with English classes. The Government's contribution would the provision of Medicare cover, special benefits and other relevant benefits as well as the provision of education and work rights. Such a contribution on the government's part would still be a considerable saving on the current cost of maintaining people in detention. The idea of Rural and Regional Welcome towns is to provide a practical alternative for the care of asylum seekers and to help foster constructive and positive social attitudes towards new arrivals. In this sense Welcome Towns is in the spirit of the Good Neighbour movement of the 1950's and mirrors the response of rural and regional Australia to the Vietnamese and Cambodian crisis of the 1970's. Our proposal is along similar lines and broadens the existing Community Resettlement Support Schemes (CRSS). What sort of towns are suitable? Towns involved in such a scheme need to be large enough to have a functioning social welfare system and to provide a pool of committed volunteers. The town should also be large enough to have ready access to translation and/counselling services including trauma-counselling services, or be within easy reach of such services. Extremely remote town would therefore not be suitable for such a project. A supportive local council would also be advisable, as would supportive school principals. Towns that already have people of different cultural and ethnic origins could be utilised to provide support to families from similar origins. Local committee would undertake to support such families or individuals for as long as their application for asylum is being processed. It would be hoped that within six to twelve months the family would know their visa application status and that with the help of the local committee be able to find employment and permanent housing. If a family's application for asylum is rejected then RAR accepts the need for them to be repatriated to their home countries. The local committee should however, have the opportunity to work with the relevant social welfare agencies and counselling services to help such families and individuals prepare for their departure. The Welcome Zone Inititiative is another program, developed by the Refugee Council of Australia, sometimes confused with the RAR Welcome Towns proposal. acknowledge the importance of upholding the human rights of refugees who have escaped persecution. City of Brisbane, City of Brimbank, City of Casey, City of Darebin, City of Greater Dandenong, Shire of Greater Bendigo, City of Greater Geelong, City of Fremantle, Fairfield City Council, City of Hume, City of Maribyrnong, Metropolitan Victoria, City of Melbourne, City of Moreland, Shire of Mount Alexander, City of Monash, North Sydney Council, Leichhardt Council, City of Port Phillip, City of Port Adelaide/Enfield, Town of Vincent, Waverley Council, City of Whittlesea, City of Yarra, and Rural and Regional Victoria.